The Terriers are back on the ice tonight, for the third time in seven days, to take on Merrimack in North Andover. 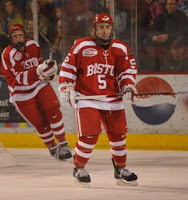 BU beat the Warriors, 5-2, in an October matchup at Agganis Arena. Merrimack has nine conference losses, but six of them were one-goal losses--and they have excellent goaltending. Freshman netminder Kieran Millan will play tonight's game and tomorrow's home matchup with BC as well, according to Coach Jack Parker, quoted in The Daily Free Press. We have links to USCHO’s weekly Hockey East Column, and a preview article from BU Athletics with links to Live Stats and WZZN’s radio broadcast. ► The Patriot Ledger talks with freshman defenseman David Warsofsky’s (photo) about his adjustment to Division 1 hockey and his standout play during BU’s trip to Denver. ► Hockey East’s season-long voting on outstanding performers during the league’s 25th anniversary continue. Former BU captain, All-American and Hobey Baker Award winner Chris Drury was voted top defensive forward. ► The 57th Beanpot Tournament is just around the corner with the first round game against Harvard scheduled for 5 p.m. on Feb.2 at TD Banknorth Garden. Beanpot watch parties have been set up all over the country, from Florida to California. Click here for a list with links to preregister, and check out a video from a recent Beanpot watch party in Jacksonville, Fla.
Hockey East Quiz: Former UNH goalie Kevin Regan was called up to the Bruins last week, but just for a practice. However, eight former Hockey East goalies have seen time between the pipes in NHL games this year. Who are they? Answers to follow this weekend.